Europe’s central, eastern and southern regions must boost their cooperation in order to carry out projects that serve to improve the region’s energy security, Foreign Minister Péter Szijjártó said at a Eurasian energy security forum in Belgrade on Friday. Szijjártó named the security of energy supply as one of the biggest global challenges today, noting that it has always been a key issue in central Europe. The minister said there were four principles Europe needed to respect concerning energy security. These, he said, included taking into consideration the interests of central and eastern European countries when deciding on energy investment projects, the elimination of double standards, letting countries decide on their own energy mix and Eurasian cooperation. He also urged the diversification of the region’s energy supply. As regards the use of double standards, Szijjártó argued that western European countries are rarely criticised for the measures they take to ensure their energy security, while central and eastern European countries often receive criticism. It should be made clear, he said, that the CEE countries have the right to be treated equally to western European countries. Szijjártó said that throughout history, central Europe had always lost out in conflicts between the east and the west. The minister added that Hungary was not looking to take the side of either Russia or the United States when deciding on energy-related matters, but was looking out for the interests of Hungarians. Szijjártó also noted that Russian energy giant Gazprom is building two lines for the Turkish Stream gas pipeline, that was regularly the target of criticism, which he attributed to “double standards and hypocrisy”. Szijjártó noted that the largest energy project, the Nord Stream 2 pipeline, was being built in western Europe. This pipeline, he noted, would transport gas from Russia to western Europe. 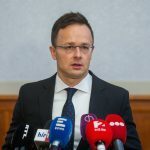 “We have to demand that such a development should also be made possible in central Europe,” Szijjártó said, adding that this would be the Turkish Stream pipeline. He said the two projects were similar in the sense that they would both serve the flow of Russian gas, both involve Gazprom and they would both involve new supply routes. On the topic of nuclear energy, Szijjártó noted that nuclear has been in use in Hungary since the 1980s. Around 40 percent of Hungary’s electricity is generated from nuclear energy, and the plan is to increase this share in the long run, he added.